Neutrik connectors are so much nicer than the alternatives. Most others require tools to assemble after soldering. No screws to hold the connector in the shell, no set screws to squeeze the cable in the strain relief. Istead, Neutrik uses a collet compressed as the connector is assembled and the connector is simply held captive in the shell. Before retirement, I worked in the pro audio industry. I've been using Neutrik connectors exclusively since the late 70's. Highly recommended! Best XLR connectors to work with. They are very easy to build with and no little set screws to mess with. I’ll never use anything else. Prefer the solder style connectors over the "knife" type that cut through the insulation when you assemble the connector. I have had too many problems with them losing contact that I have replaced most of them with the Neutrik connectors. A little harder to assemble, but when you are done, the connection between the wire and the pin is solid. 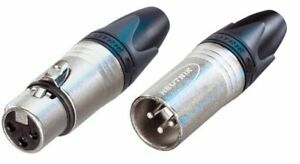 As with other Neutrik connectors, these are well-designed and well-made. This particular model is efficient in that they are not over-built and cleverly use cheaper plastic parts to augment the high-wear metal parts. Very good quality and easy installation.